Netflix Inc. NFLX has signed a multi-year deal with one of the most successful television producers, Shonda Rhimes, the name behind popular shows like Grey’s Anatomy and Scandal . Her production company Shondaland, run by Rhimes and her partner Betsy Beers, will oversee a new series and other projects. Reportedly, Rhimes has ended her 15-year tenure with Walt Disney’s DIS ABC studios to produce original content exclusively for Netflix. Per The Wall Street Journal, Rhimes’s work “has generated more than 2 billion in revenues from advertising, rerun sales and international licensing” for ABC. We can thus anticipate a similar impact on Netflix as well. Reportedly, Netflix has renewed the series Ozark for a 10-episode second season. Last week, the company announced an unnamed talk show by the prolific David Letterman and a Western anthology series by Oscar-winning Coen brothers set to release in 2018. We believe that the company’s continued focus on producing more quality original content is driving its top line. Reportedly, there will be 40 original movies this year, with expenditure on original content expected to touch $6 billion in addition to another billion dollars on marketing. Its improving content portfolio will drive subscriber growth and further boost the stock price. Notably, shares of Netflix have gained 34.5% year to date, significantly outperforming the industry ‘s 13.4% rally. Moreover, expanding original content portfolio is anticipated to provide competitive leverage against the likes of Amazon AMZN Prime, Hulu and Time Warner’s HBO. In the last quarter, Netflix added over 5.2 million subscribers, much more than the expected 3.2 million. The company’s focus on international expansion and original regional content has paid off, with 4.14 million net new additions overseas in the quarter. Further, the company remains confident of adding more subscribers as the trend of binge viewing catches up fast. In the third quarter, Netflix expects to add 0.75 million subscribers in the domestic streaming segment and 3.65 million in the international segment. Moreover, the company expects to report profits from International operations in the quarter, which is a positive, in our view. Currently, Netflix has a Zacks Rank #3 (Hold). A better-ranked stock in the broader technology sector is Alibaba Group Holding BABA , which carries a Zacks Rank #2 (Buy). You can see the complete list of today’s Zacks #1 Rank (Strong Buy) stocks here . Long-term earnings growth rate for Alibaba is projected to be 28.57%. 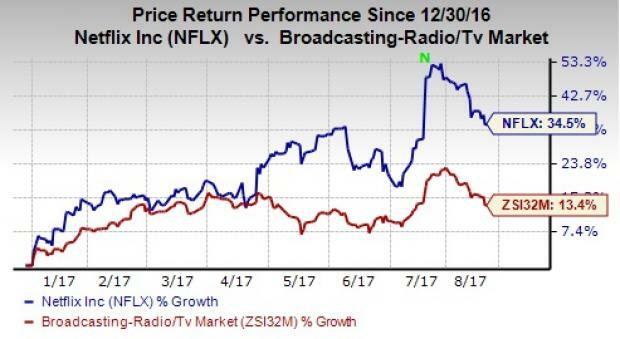 Why Did Netflix (NFLX) Stock Dip on Thursday? Why Did Netflix (NFLX) Stock Gain Today?